Low Tone And Toilet Training: Pull-Ups or Cloth Training Pants? My post on clothing choice when toilet training a child with low muscle tone Low Tone and Toilet Training: Teaching Toddlers to Wipe covered a lot, but it did not include a very important garment: underwear. I am putting pull-ups and their generic equivalents in the underwear category. Many would not, as they are as absorbent as a diaper, disposable, and most children themselves do not think of pull-ups as step toward being a big boy or girl. Apparently they do not watch or believe the ads. Kids with low tone often aren’t as aware of touch input as other children, and aren’t bothered by the very mild warmth and wetness of an absorbent undergarment. Sometimes they don’t even notice it at all. That will make it harder to recognize when they have had an accident, or when they need to get to the toilet right now. This sensory-based issue is one of the two big issues with teaching low-toned kids Why Low Muscle Tone Creates More Toilet Training Struggles for Toddlers (and Parents!). Being able to dash to the potty and successfully avoid an accident is a big deal for them. This is an accomplishment, and wearing a garment that prevents them from experiencing success reduces training progress. I understand that having an accident is not fun for either the child or the parent, but it is memorable. No one learns unless the lessons are memorable. Understanding what those body signals mean and respecting them is the cornerstone of training, and for kids that need to listen to their bodies, it is essential that they not ignore them. The Baby Whisperer even encourages parents with children that refuse to sit on the potty and intentionally make in their pants (not exactly an accident, but a mess nevertheless) to take off their clothes themselves and jump in the tub, then wash themselves off. They get some help, but this isn’t playtime. There is no quick wipe-off as they stand in front of the TV, watching the show they refused to leave to go potty. Her thinking is that it is not done as a punishment at all, it is a natural consequence of intentionally not answering the call of nature. No harsh words, no threats, but no continued watching of that show either. These children are often unsteady when they are calmly standing still, so being in a rush to pull their underpants down to use the potty is not likely to make them more stable and coordinated. Picking a garment that they can pull up and down easily under pressure is the only kind way to go. You may have to try both to see what your unique child can manage, and do dry runs Low Tone and Toilet Training: The Importance of Dry Runs (Pun Totally Intended). I explained it to a stylish mom this way: if you have to use the toilet really badly and you have spanx and stockings on, think about how embarrassed you would be not to make it in time. That is what many kids feel every time they need to go. Dads, if you do not know what spanx are, ask! Imagine wearing bike shorts under your khakis. Then add thin long underwear over the bike shorts. Got it? Some kids are mature enough to care about the graphics on their clothing, and it’s enough to motivate them to commit to toilet training in the first place. If you can only find the specific superhero that your son adores on a pull-up, you may have to use it, at least at first, to get him excited about learning. If you go for the cotton pant/waterproof liner combo, you will have to be more vigilant and have kids change out of them more often. Some kids have more sensitive skin, so make sure you are giving them a little diaper cream as a barrier if you know that your child has had some diaper rash as an infant. As your child stays dry for longer periods, you can even take off the cover for more breathability. Pull-ups are one-and-done, no way to decrease the level of absorbency and safety. There is one strategy that “kinda” works for the younger kids: a pair of underwear and then the pull-up. They get wet/soiled and kids have a modified experience of an accident without as much mess. But even this solution limits the real-life experience of really, really having to get to the toilet on time. This is one reason why children do not want to give up the pull-up. The older toddlers understand all too well that it is a huge leap from diapers or pull-ups to a thin pair of underwear. That seems to me to put a lot of pressure on a small child. I think that this is one reason that toilet training all children has moved later and later. It has nothing to do with less pressure on them to train or more freedom of children to choose. They are afraid to fail at something that their parents clearly value. They want to please us and succeed for themselves. We should do absolutely everything we can to help them feel good about themselves while learning this important life skill. Having an accident can be an opportunity to learn and not be judged. This entry was posted in parenting, preschoolers, self-care skills, toddlers, toilet training, Uncategorized and tagged baby whisperer, low tone, low tone and toilet training, potty training, pull ups, underwear for toilet training on July 3, 2016 by Tranquil Babies. How Early Can You Use The Happiest Toddler Approach? Something happens to babies between 12 and 18 months. The adorable little child that could be easily distracted from grabbing your earrings, ate anything you offered, and smiled when you praised him is replaced by someone whose favorite word is “NO! !”, delivered at astonishing volume for a person who weighs in at only 23 pounds. Welcome to toddlerhood. Get ready, it is going to be a bumpy ride! Dr Harvey Karp’s Happiest Toddler techniques are usually discovered by frustrated parents of two year-olds who are tearing around the house, taking hostages. But these effective behavior management methods can be cherry-picked to be used with younger toddlers. In fact, starting early with patience stretching and the Fast Food Rule Taming Toddler Tantrums Using Sympathetic Reframing is a smart way to grow a toddler. These techniques really do teach patience with kids Stretch Your Toddler’s Patience, Starting Today! and teach them that their complaints will be heard without always getting their way. Dealing with bad habits later takes longer than instilling good ones any day. You just have to be aware of which methods work for tiny minds and start planting the seeds before things get out of hand. Some methods, like Giving It In Fantasy, will not work. Young toddlers do not have the capacity to distinguish reality from fantasy. Too many words, as well. Same with Gossiping About Good Behavior. They think that you are talking to them and don’t get the full effect of “overhearing” a compliment. Not sure you want to “time-out” a 14 month-old? Use Kind Ignoring, in which you momentarily turn away from the whining or defiance of a very young child. Ignore the behavior briefly, even move 10-15 feet away without saying anything or making gestures or even a negative facial expression. In fact, doing nothing at all but removing your self from the banging or throwing of toys sometimes works better than a statement or a look. Your action coveys that this is not going to get your attention, it is going to remove you from their presence. So much of the time, the littlest toddlers are doing these things to engage you when they don’t have the words to do so. Don’t take that bait, and you have avoided what the Baby Whisperer would call “accidental parenting”. She is a big believer in “start as you mean to go on”, and so am I. Consistency gives all children a bedrock at home and at school. They know what to expect, how to gain attention and how to successfully communicate even at an age where they have less than 20 words. If you want more peace, don’t think that you have to wait until you can have a conversation about behavior with your child. The door to communication is open way before that point! This entry was posted in behavior issues, preschoolers, toddlers, Uncategorized and tagged baby whisperer, discipline and toddlers, Dr. Harvey Karp, happiest toddler on the block, patience stretching, preschoolers, time outs, toddler behavior, toddlers on June 16, 2016 by Tranquil Babies. Time potty time about 20-30 minutes after meals and snacks. The act of digestion and drinking should stimulate urination and bowel movements, and you might get results whether or not your child can respond to subtle sensations. You can then work backward, and help your child connect the event with the sensation. Know your toddler. Most parents can easily identify when their child is ready to have a bowel movement by their expression or posture. Some children duck behind the couch or stand in a corner. Signs of urination are often more subtle, but wiggling while sitting or standing is a common one. That’s the time to announce a trip to the bathroom! What goes in on schedule will come out on schedule! Avoid constant drinking throughout the day while training, and switch to only drinking at meals and during scheduled “drink breaks” through the day. The goal is for you to be able to anticipate when his bladder will be full, and then have him use the toilet successfully 20-30 minutes later. Connecting the sensation of having a full bladder and the experience of urination is easier this way. This may be a big change for the child who carries around a covered cup and sips all day long, but once he is trained, you can go back to the “sippy life” if you wish. Make sure that you have a plan, whatever it is, and know why you are doing it that way. If you have a nanny or daycare provider, make sure that they know your plan and your rationale for it. Children do best when they sense your confidence and support. That doesn’t mean you cannot adjust things, but if you are just tossing new ideas out there every few days, it can be very hard for a sensitive child or one with limited modulation to handle all that change. If your older toddler really struggles with control issues, and you suspect that they are resisting toilet training to establish their control rather than just struggling to learn a skill, then you need to address this first. Establishing limits and building communication skills so that you are teaching more than begging is almost essential. I suggest the Happiest Toddler methods to develop a strong alliance with you, based on mutual respect and cooperation. Do not underestimate good positioning. Toddlers that seek movement constantly, fear falling, or those with a lack of stability all need to get their feet steady on either a stool or on the floor. Some children with sensory issues can use the little rings over a standard potty, but it is more common for children with SPD to need more support. They may not tell you they need it, they may just want to get off, not want you to leave them, or refuse to even hop up there. If your toddler is often overexcitable or under-responsive to sensory input, he may have poor state modulation. Your occupational therapist should be able to tell you if that is an issue for your child. A nervous system that is idling too slowly isn’t registering the sensations of a full bladder. The children that are overexcited will be paying attention to just about anything else. Either way, use the techniques that work to create a more modulated state. The Wilbarger Protocol, the How Does Your Engine Run activities, and more can help your child regulate their sensory arousal so that they can accurately perceive what is happening. Remember: independent toileting is a skill, and your child will develop this skill. Think of all the skills they have acquired in the past few years. This is the next one! This entry was posted in autism, parenting, sensory processing issues, toddlers and tagged autism and toilet training, baby whisperer, sensory processing and toilet training on January 19, 2015 by Tranquil Babies. Imagine that you know an easy way to send your baby into a longer and more restful sleep. But guess what? You have to wake him up to do it. Welcome to the world of the dream feed. The dream feed concept is not my own, but it is one of the most useful strategies a parent of a 2-10 month old can have. Both Dr. Harvey Karp ( of Happiest Baby on the Block fame) and the Baby Whisperer write about using the dream feed. This can be used for both nursing and bottle-fed infants. The theory is sound, but the understanding is that the parent is intervening to build deeper and more satisfying sleep, not just hoping it will happen. The dream feed challenges parents to do the one thing they might not ever want to do: wake a sleeping baby. But if you think about the pattern of infant sleep and what makes babies sleep longer and deeper, you will completely lose your fear of waking your baby. The key is to time your dream feed somewhere from 10PM-midnight to avoid the creation of a habit of crying triggering more night feeding, and subsequently reversing night and day. For mothers who are nursing, that first let-down milk is rich and full of nutrition. You may switch your baby to the other breast before he is completely full in order to get a double dose of that early and belly-filling milk. What a lovely idea; an almost-midnight snack filled with nutrition to send your baby to sleep ! To review: dream feeds give your baby…. hunger in the morning, setting her up to associate daytime with mealtime. a last bit of advice: this is not playtime, so be loving but not very talkative or playful. You are sending the message that this is mealtime, not a social hour. If your baby is fully awake and wants to play, use white noise and low light to send her attention back down to a drowsy feeding. Need more information? Take a look at Teaching Your Baby to Sleep Through the Night and Baby Waking Up Early? Reset that Habitual Pattern Tonight. Want more support for your newborn? Visit my website tranquilbabies.com. and purchase a phone/video session. Ask specific questions, receive recommendations on books and newborn equipment like swaddle garments/swaddle blankets, and more! This entry was posted in infant sleep strategies, newborns, parenting and tagged baby whisperer, Dr. Harvey Karp, dream feed, newborn feedings on January 12, 2015 by Tranquil Babies. 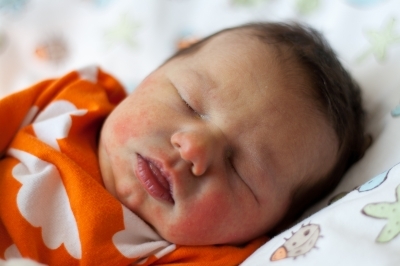 Can You Sleep Train a Newborn? Sleep training is a hot topic with parents of older babies and toddlers. So many are struggling and bewildered. New parents either pray they will escape this fate or confidently assume they are the exception. It isn’t really the roulette wheel that it seems. Parents are often told that they cannot do much to develop good sleep habits until a child is 3-4 months old. Well, waiting until then may have already set your child up for trouble. Both the Baby Whisperer series and Dr. Harvey Karp’s Happiest Baby on the Block books describe routines that are loving and sensitive to a baby’s needs. They don’t take sides on the co-sleeping controversy. Both teach families how to read a baby’s cues and create early healthy habits that can survive teething, illness, and growth spurts. A very young baby can anticipate and can benefit from a routine (not a rigid schedule) that starts in the morning and brings them to nighttime ready to rest and renew. My favorite newborn strategy is the “dream feed”. Waking your baby (yes, waking them up!) to have a filling feed not too long after that initial bedtime nursing or bottle tops them off for a longer period of sleep. A brain that is used to a cycle of naps during the day and a longer sleep at night is ready for the greater demands of the day (and night) at 3-4 months. The child who has no sense of day and night and wakes habitually at all hours is never refreshed. Never mind the state of his parents. The other strategy that makes a huge difference to families is to understand that bedtime really starts in the morning. If your child’s schedule has been disrupted intentionally or unintentionally, it will make it very difficult to fall asleep. Not responding to those subtle sleep signs will sabotage a very good bedtime plan. If you want to develop good sleep routines,then time, tide and sleep wait for no baby. This entry was posted in behavior issues, infant sleep strategies, newborns, parenting and tagged baby whisperer, happiest baby on the block, sleep training newborns on June 9, 2014 by Tranquil Babies.